There are a gazillion different names out there for emergency preparedness kits. 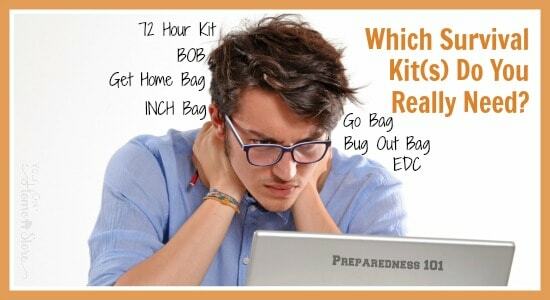 If you’ve been researching emergency preparedness online for long you’ve likely heard most of them: 72 hour kit, Survival bag, INCH bag, BOB, Bug out bag, Go bag, Get home bag and MORE! It can get confusing to figure out what you really need. 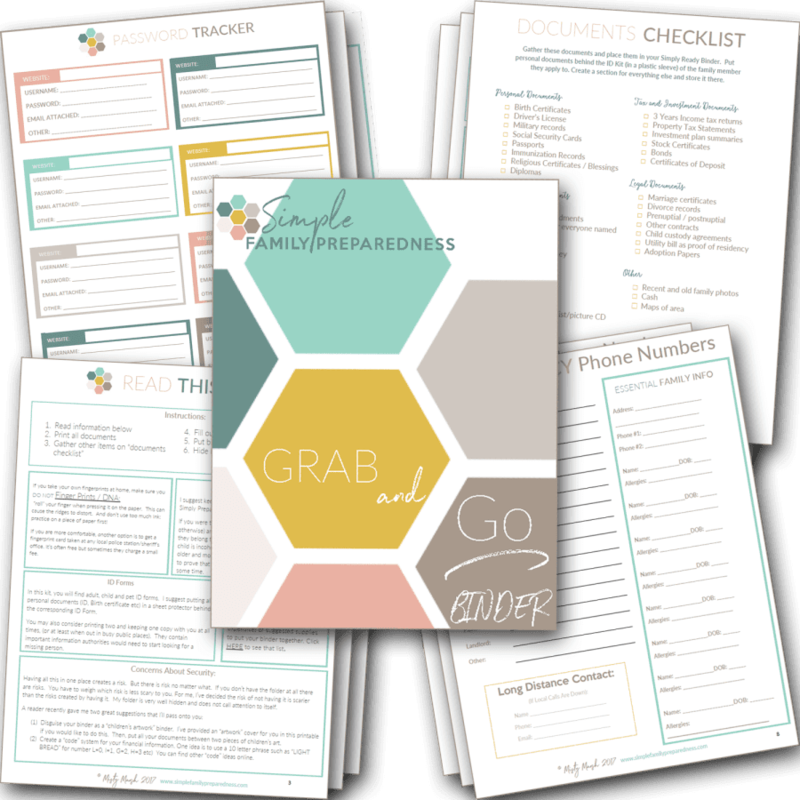 Today, I’d like to simplify the idea of emergency kits for you! I’ve mentioned before that in many (possibly most) emergency and disaster situations it is best to stay home, and we’ve talked about having a kit or a stash of supplies in your home for that purpose. This is the first kit you should have. We walked through that in week #14. This is kit #1. Then, since we all spend a lot of time with our vehicles, you should also have an emergency kit in your car in case of a breakdown or getting stranded. We walked through that last week. This is kit #2. Are you with me so far? *wink wink* Just two kits so far! Next, there are some situations where evacuation will be best and this is where it can start to get a bit confusing. Whether short notice or sufficient notice, the items you should take for evacuating by foot are different than those you’ll take if evacuating in a vehicle. In fact, there isn’t really a way to put together a full physical grab and go kit for what you’d take if you could leave by car. Many of the things you might take (extra food, iPads, external hard drive, jewelry, a camera etc) are things you use every day. So, in the case of an evacuation by car, I suggest you prepare a prioritized list of what you would grab. Then, keep as many of those supplies as near an exit as you can. When asked to evacuate, simply start at the top of your prioritized list and work your way down until you have to leave. We went over this scenario in week #4. But if you need to get away from your home and can’t take a vehicle things will be different. What do you grab then? Even if you are planning to come back home after a few days, you will need supplies for those few days. Or, if you are planning to walk to a friend or neighbors house or a shelter, you will need supplies to get you there. This is where a 72 hour kit / bug out bag / go-bag will come in handy. Essentially they are all the same thing, just called by various names. The idea is the same: having supplies that will allow you to care for yourself and your family for 72 hours without shelter is essential. This is a kit you need. This is kit #3. What if you aren’t home when disaster strikes? Maybe you don’t have to evacuate for any reason, but you’d sure like to be with your family and your home will likely have more supplies than your workplace, the grocery store or the soccer field. Personally, I don’t really see this kit as a whole lot different than a 72 Hour Kit G0-Bag. The only real difference would be the amount of supplies. Assuming you work within 45 miles of your home, you could likely walk home in one day (3 mph pace) and you may not need a full three days of supplies (Obviously, if you are further away, it will take you longer). You may not care as much about things like a toothbrush or soap or entertainment items. But otherwise, this kit is essentially the same as as your 72 hour kit go-bag. We have 3 days worth of supplies stored at home. We have a car kit in each car. In addition, my husband keeps his 72 hour kit go-bag in his car and I keep mine and our kids in our van. If we are home and need to evacuate, we simply grab the kits out of the cars and go on our way. If we are away when disaster strikes, we strap it on and walk home. I have not spent the time or money to create different kits for those two different purposes. So that’s it! A prioritized evacuation list (in case you go by car) and three kits! 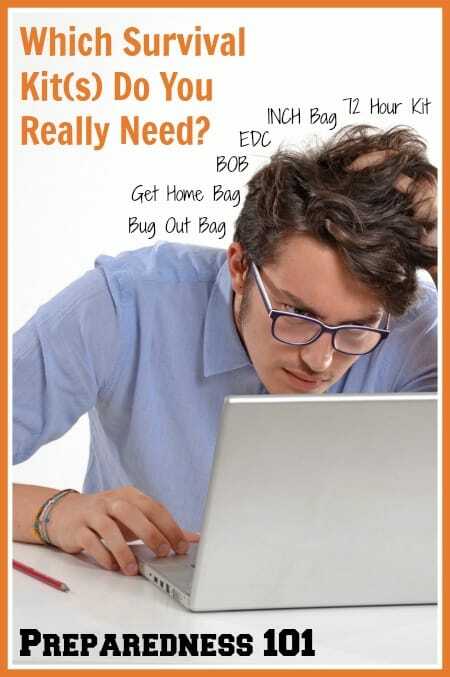 I don’t see an office kit in your plans but maybe your Get Home Bag covers this. If an emergency occurs while at work, sometimes you can’t get to your car. It is best to have an office kit ready as well. I have 3 days of food and water plus a hard hat, pry bar, masks, and a real first aid kit. It does not need to be fancy, just a few things. This is pretty critical if you work at a location with lots of other people because you might not be able to get to your car. You are right Shielah. I may add an “office” kit list into the course somewhere. Darn, there are just so many different kits!